This unaccompanied flute quartet with a jazz swing pulse has a light and breezy lyrical feel, despite the rhythmical challenges of the syncopation combined with the swing. 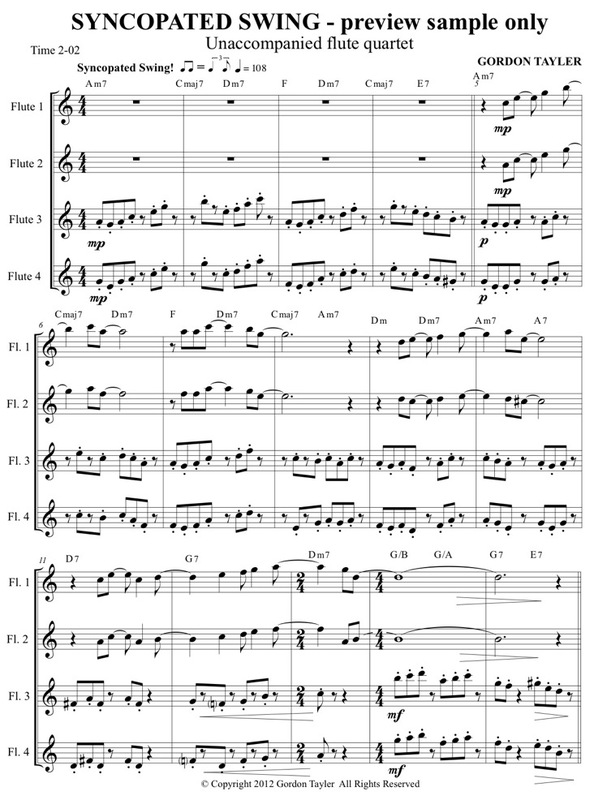 Flutes 1 & 2 carry the legato lyrical melody in 2 part harmony, while flutes 3 & 4 provide a 2-part staccato accompaniment. Flutes 1 & 2 could experiment with some jazz techniques with added embellishments, bending some of the longer notes at phrase ends, or perhaps rapid descending chromatic glissandos. But don’t change things too much, or flutes 3 & 4 may lose where you are. Jazz is nearly always about rhythm – so get this right first.